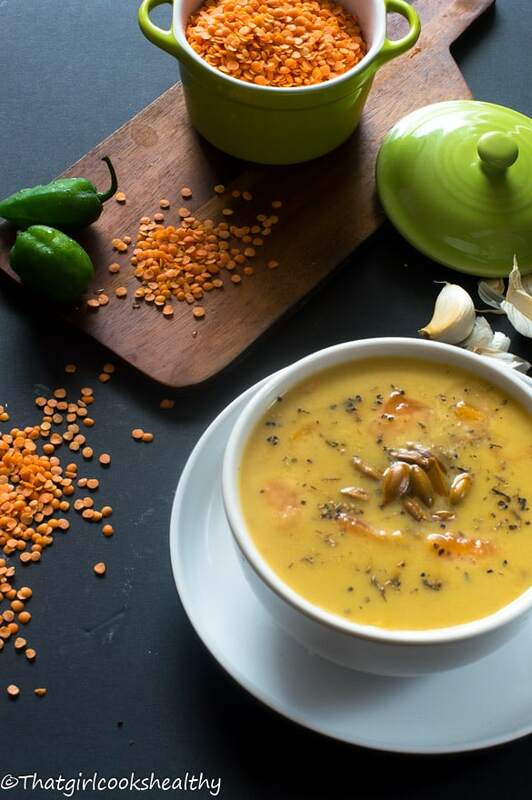 Caribbean pumpkin lentil soup – a delicious heart warming soup that’s brimming with island flavour, great to drink on a cold winter’s day. You know that fall is in full effect when you’re in the supermarket and greeted by a large number of pumpkins. It seems like every corner that I turn in the store there appears to be a pumpkin insight. I believe that this was a sign, a calling telling me to make a pumpkin recipe to which I succumbed to. Pumpkin is an essential vegetable in many Caribbean dishes from desserts to pudding and/or even soup. In fact it is highly favoured over it’s big sister butternut squash. I tend to alternate between cooking with squash and pumpkin, depending on the time of year or the recipe to hand. 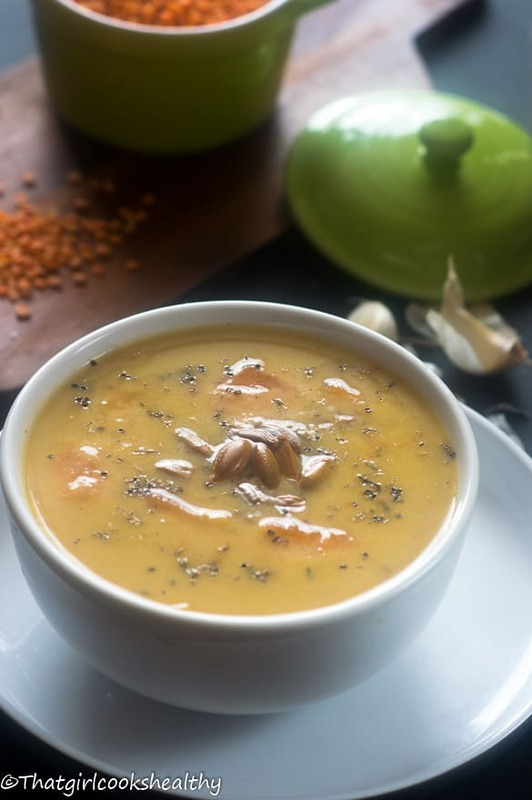 In my humble opinion they taste virtually the same, so it’s safe to say that this recipe can be made all year round with squash, therefor, you don’t need to wait until the fall to make my spicy pumpkin lentil soup. 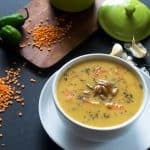 This soup offers a nice little taste of the Caribbean only vegan style. Contrary to popular belief not all Caribbean soups contain meat. Granted you’ll find fish, chicken and soup containing some beef or pork BUT…. Islanders aren’t afraid to venture down the vegan route with a few root vegetables and legumes, both of which play a crucial role in the Caribbean lifestyle. 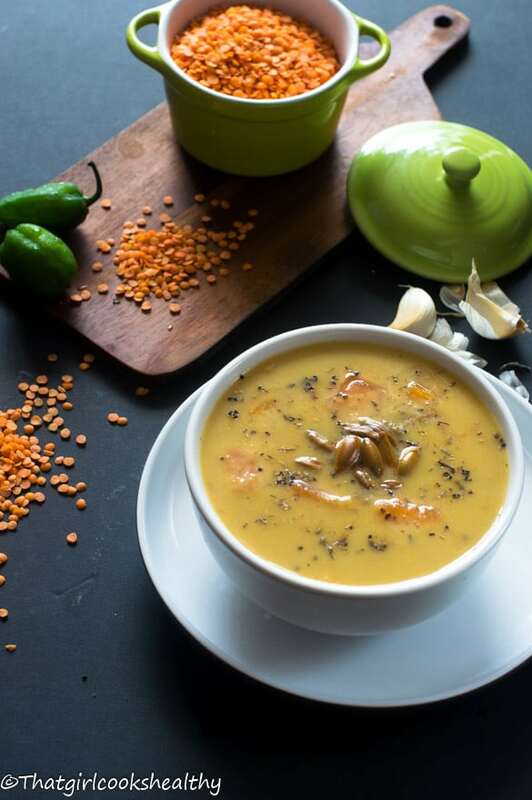 I would describe this Caribbean pumpkin lentil soup recipe as cheap, cheerful and most importantly healthy. Lentils are one of the cheapest legumes you can obtain. I brought a huge bag for 75p which is a unbelievable bargain. Pumpkin/squash are both reasonably priced too. You can make the stock from scratch using my recipe and the coconut milk too to save yourself some additional money. One ingredient that might be problematic is the scotch bonnet – queen of the Caribbean. I added this whole for flavour and warmth only not heat. Do note, you can purchase scotch bonnet from any West Indian grocery store. Alternatively, you can use an fresh chilli instead. Whatever you do DON’T I repeat DON’T cut the pepper/chilli, it is used for flavour only not spice as the chilli flakes will bring the subtle heat. Remove the pepper/chilli just before the soup is pureed. On low heat the coconut oil in a non stick saucepan and proceed to sautee the onions and garlic until golden. Pour in the vegetable stock into the saucepan. Stir in the ginger, thyme, chilli flakes, black pepper, pink salt, pumpkin and lentils (in that order) and bring to the boil. Reduce the heat to medium and pour in the coconut milk and add the whole scotch bonnet. Cover the saucepan and simmer for 20 minutes until the lentils and pumpkin have tenderised. Meanwhile clean off the flesh from the seeds and rinse them thoroughly. Preheat a small frying pan and toast the seeds, they will begin to pop and look golden once done. Remove the soup mixture from the saucepan and transfer into a blender. Sprinkle with palm sugar and toasted pumpkin seeds prior to serving. I just made this recipe and it is delicious! Thank you.. In my opinion it is helpful to have amounts when listing ingredients, such as approx how many cups of squash along with the size. Also how much dry thyme if fresh isn’t available. Just a suggestion. The soup has really nice flavor and I love the addition of the lentils which is why I chose to make it. I didn’t have red lentils only brown so the color isn’t as vibrant as it might be but who cares, it still tastes great!!! Thanks again, looking forward to trying more of your recipes. Hi Judy. Glad you enjoyed the recipe. I will definitely take your suggestions into consideration and amend the recipe accordingly. This is a great recipe– thank you! I had a similar soup at a restaurant and wanted to duplicate it. This recipe came out tasting very similar. Glad you liked the soup. It’s a personal favourite of mine. I am so happy to have found you! This was another wonderful dish — and talk about healthy. This was delicious, than you! Hi Raquel! Welcome 🙂 Thank you. I am so humbled by your comments. This soup in particular seems to be a hit with my readers.